Bizzarrini started a cooperation with Giorgetto Giugiaro – a Bertone designer in that time – that resulted in the Iso Grifo A3L (L for Lusso) unveiled in 1963. It was based on a shortened Iso Rivolta GT chassis with an extremely low and wide handmade bodywork styling. Here is one featuring the camping of Le Mans, were plenty of classic car clubs put cars in their context, here it was with a Solex and a VW Combi. It was one of the fastest production car of its time with a top speed of 160 mph (260 km/h). Later Iso Grifo 7 Litri units were powered by a big block Chevrolet Corvette 350 bhp engine. Thanks to Le Mans Classic, these rare cars are back on track, enjoy this footage I made in the 2010 edition. Now there is still something I cannot explain: Why are these race versions featured in Le Mans Classic getting the “Strada” sign on their back pillar although they are obviously “Corsa” versions? Does anybody reading this have any clue on that? The GT 5300 Strada is a Bizzarrini designation. So, the Iso Grifo A3/C would not have had this scrip on the car. Probably there was no script on the back pillar of an A3/C. thanks for commenting here, I’ve seen plenty of nice Iso rifo / Bizzarrini shots on your blog. To come back on the version featured at Le Mans Classic, it was clearly announced as a Bizzarrini. So my point is just that it looks strange to have strada versions obviously prepared for racing and not the “Corsa” version. 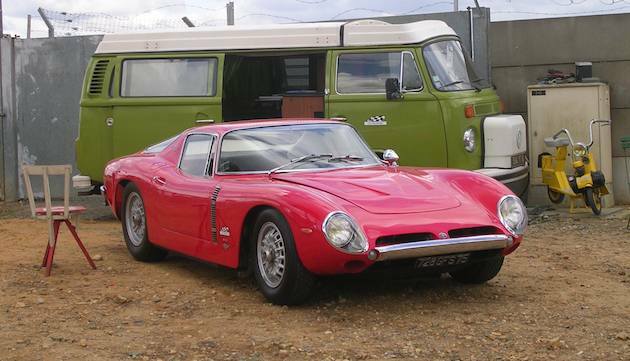 Maybe these Bizzarrini’s were Strada versions upgraded to “Corsa” specs? I do not think that an original A3/C or Bizzarrini Corsa would have the Strada script. It is possible that this was added later or maybe it is a Strada converted to race specifications as you said. This certainly has happened as there were only 22 of the A3 and Bizzarrini race cars made. Do you know the chassis number of this car?